I love post-apocalyptic literature, and I love vampires, as anyone who knows me well can attest. Combining the two, as Justin Cronin did in The Passage is a dream come true. Waiting fifteen months for the second installment proved difficult at times. As it turned out, The Twelve was well worth the wait. 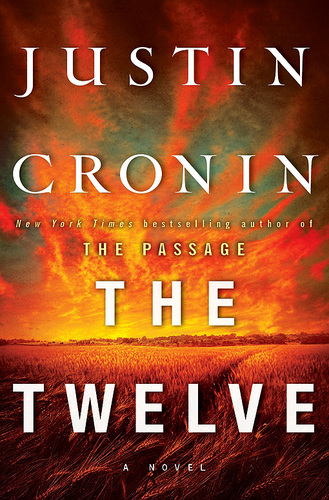 The genius of The Passage was Cronin's willingness to play with the traditions of vampire literature. By identifying vampirism with an ancient virus from deep in the valleys of South America, Cronin broke from the tradition of Bram Stoker and and breathed new life into a genre of literature that had been consumed by the sparkly, vegetarian pretenders with whom teens today have been inundated. Cronin's viral vampires are shorn of any romantic notions; they are blood thirsty creatures bioengineered by the American military. Where in the first book we learned about a single community that survived the apocalypse, only glimpsing the rest of the country ever so briefly at the end, in this second volume, we learn the sometimes gruesome details of the lives of the other survivors. Exploring life in the new Republic of Texas and in a slave city run by vampire familiars, we are introduced to the rest of the story. Five years later, and we meet up again with Peter, Alicia, Michael, Hollis, Sara, and the others who escaped from the California sanctuary that had held for nearly a century. And Amy, the Girl from No Where. Life has attained a new normal, with Peter and Alicia hunting the eleven remaining original virals (convicted felons, each worse than the next weaponized by the US military in an off the books operation in Denver). The others are scattered, each embracing new lives, some of their choosing, some not. 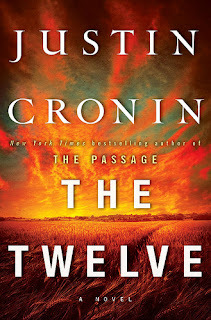 In The Twelve, Justin Cronin returns to the original apocalyptic moment, introducing new characters who will interact in different ways with the original characters from The Passage. Easily one of my favorite new characters is Bernard Kittridge, better known as Last Stand in Denver. A poignant portrait of a wounded warrior faced with surviving the apocalypse. The description of the man, his motivation, his intensity, and redemption are spot on. Cronin's gift as a writer is creating characters the reader cares about deeply, but also characters who are real, they are people we know. He is able to capture the mundane, as well as the very best and very worst of humanity. One of his new characters, Danny Chayes is an autistic man (though Cronin never uses the word, the description is pretty text book) who is responsible for saving at least a dozen lives, and even the start of a new generation. It is the first time I have seen such a brilliant and positive portrayal of an autistic character in the fiction that I have read. My only regret in reading The Twelve is that I did not go back and read The Passage again to refresh my memory on the details. Now, I wait, less than patiently, for the final installment and the confrontation with Zero. Can't wait to read it! I'm glad of the recap, though. I wasn't feeling a re-read of The Passage, no matter how much I loved it.